I'm talking about the Joe-Pye-Weeds, aka as Eupatorium dubium, E. fistulosum, E. maculatum, E. purpureum and E dubium (aka Eutrochium). I can't tell you when E fistulosum came to live in my garden but, I've loved it dearly from the first time I saw it in bloom in a wilderness area dozens of years ago. It's a tall drink of water that tops out at about 10 feet in my garden, but, can be even taller in the wild. I think of it as one of my rough and tumble wildflowers. What all the Joe-Pyes have in common are great big mauve/lavender-pink flower heads that bloom almost all summer and into the fall. They are also magnets for butterflies, Bumbles and other pollinators. 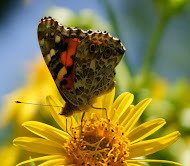 The flower heads are perfect feeding and perching stations for the many butterflies that seek out its nectar. I strongly recommend it for every wildflower, butterfly and ornamental garden. This one plant has a lot going on~ color, texture, beauty and wildlife value. You're right, it's not perfect! It needs to be well established to handle a hot, dry summer and even then it might need a big gulp of water once a week. I admit, the straight species is tall and can fall over in a heavy rain and the foliage is often described as coarse; but, tall plants like Vernonias and Joe-Pye-Weeds can be cut back to keep them bushy and the leaves and deep colored stems offer contrast and texture that gardens often need. Having said all that, it still goes on my list of highly recommended wildflowers. Trust when I tell you that you don't have to worry about taming your species Joes. They've already been tamed! There are marvelous cultivars that will fit in any garden. Try the cultivar 'Baby Joe', for your smaller garden, at under three feet it's just right; 'Gateway' or 'Little Joe', will stay under 6 feet, you'll get presence without the super height; or, if you have the space and want drama, go for the straight species. Average Height: 3 ft. - 7 ft.
Average Spread: 1 ft. -3 ft. I love the Joes, Gail, such a cute name for them. Much better than the taxonomists constant changing and rearranging! They are butterfly and pollinator magnets, but most of them do get tall. The better to see you, my dears. I also love Joes and they seem to find their way all around my gardens. Some volunteers will be moved to the meadow this fall so they can freely move their too. Just a gorgeous wildflower!! 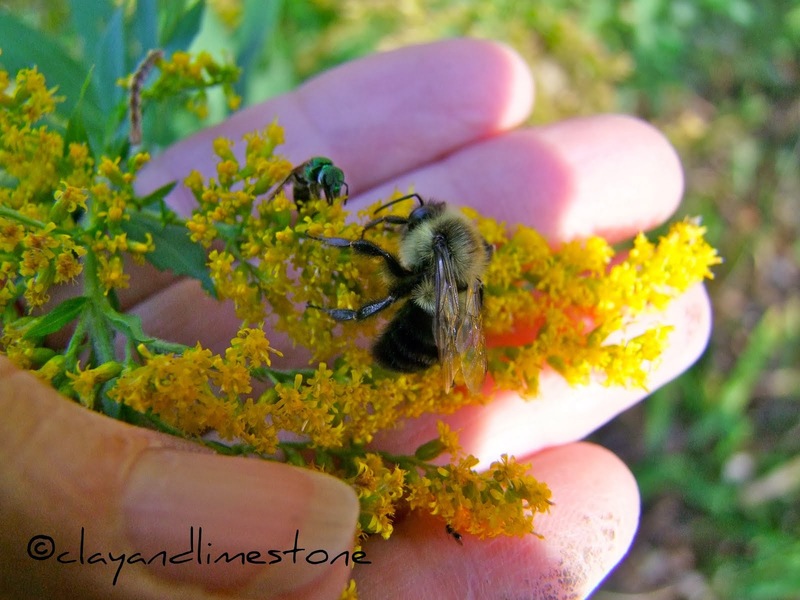 I have 'Little Joe' in my late summer garden and almost wrote about "him" for my Wildflower Wednesday post. Instead, I wrote about Wing Haven, the garden down the street from Elizabeth Lawrence's garden. Thanks for coming up with this idea to post about wildflowers and heighten awareness of them. One of my Joes is the first plant I put in my post. One of the first plants I put in when we moved here was a Joe Pye weed. It used to wilt a lot in the heat of the day. I don't remember if the one I have now is that plant, that I moved, or if I got another one. I don't remember if it is 'Gateway', but it is about 8 feet tall. I want to get another plant that gets at least almost that tall for another part of the bed so it won't be the only one towering over everything. I enjoyed your photos. I have always loved your bench. Thanks for hosting Wildflower Wednesday. Sadly no blooms from my Joes this year. Too dry. I am just hoping that they survive. Happy WW. I wonder why they are called 'Joe Pye'. We have a similar weed as that of your E fistulosum, but ours is white, very invasive and difficult to control. It was not here before the Pinatubo eruption, many people are amazed at its instant proliferation in an area, all of a sudden and they seem to be everywhere! I hate it too in our area as even the roots left in the ground will still grow. And i love your green insect and butterfly. Our Joes are so much shorter than usual this year! That seems to be the case with so many of the plants in our garden. They seem to be dealing with the heat and drought by staying smaller. Wonderful photos, as always, Gail! Thank you for hosting WW. Such beautiful photos, Gail, and what a fantastic job you've done of capturing all the critters that enjoy the Joes. I think I have the species Joe, and it's looking a little droopy this summer with the lack of water, but at least it's blooming. I'd like to add more, if I can find the space for them--they certainly are dramatic backdrops for any garden. I love the texture of the leaves too! Argh! I didn't know one of the Joes had a name change. Thanks for the tip on that. Eupatorium fistulosum is a magnificent plant, I wish I could see yours in bloom. (It's way too big for my garden.) I have 'Phantom', which is even shorter than 'Little Joe'. I love me some Joe. I have been looking for a source for the Baby Joe. . .maybe someone has a link. Anyway, I am not opposed to rescuing Joe from the ditch here in the piney woods of east Texas. Joe Pye was a real person who was a kind of herbalist, maybe an Indian medicine man. Bill, I know and I find it easier to just call them Joes! This is the first year I have Joe in my yard. Still 6- 18 inch seedlings, they are all in moist areas, hope they are happy. The Joe Pyes are wonderful plants, much loved by butterflies as well as gardeners who enjoy watching them. Yours are beautiful. Happy Wildflower Wednesday to all! I added a variegated Joe Pye Weed to my garden earlier this summer. It's lovely but struggling given the drought. Hope it will pull through. Love your photos! I have a 'Little Joe' that's just starting to bloom. It was starting to curl over during that heat wave, but thankfully we've now been getting some rain which has revived it. They are beautiful plants! Put a link to my post Gail. Thanks for sharing this meme, it is very informative. Joe is favorite wildflower of mine. They are not that prevelant in my part of the country, but drive west of here into the mountains and there they are. They seem to love the ditches and low areas. I am reminded of summer camping trips whenever I see them. OK, you've convinced me--I need to add Joe Pyes to my garden. Thanks for the information and the inspiration! I planted Baby Joe last year and somehow managed to kill it over the winter. I had rather given up on the idea but your photos are telling me I need to try again in another spot. I love the "Joe's." Last year's drought killed the "Papa," but 'Little Joe' has been doing well in the Sunny Corner Bed. I've been supplying enough water for that bed to do well, so far this year. Love that we received 3/4" rainfall last night!! The first in several weeks. lovely! I've seen it for sale, but haven't known where to put it. I'll have to keep looking. So many lovely Joes! I like the bee, wasp, and butterfly too. The closest I come is a seed packet somewhere in my stash. I have a few seed-grown natives that surprised me by blooming recently. We went to the Karoo Desert National Botanical Garden to see winter aloes and snowy mountains. Back to our own garden where the aloes are starting to flower in turn. Great native plant choice Gail ~ I love them too. Unfortunately they aren't doing so great this summer with all the heat & drought. A LOT shorter than normal but looks like they will bloom. Our August last year was super hot & dry too & I noticed the bloom heads dried up quickly. I'm going to try & give them extra water this year so it doesn't happen again. They are usually loaded with jagged ambush bugs here which is the only downside for the pollinators. I am jealous I don't see them on your plants??? Very entertaining post. I have never been successful at all with Joe. Maybe the fifth time is the charm as I have a chocolate variety which seems to be doing alright in the east garden. The joes are on my list of must haves...now just need a bit more of garden to plant them in. I thought I ordered some Joe Pye weed this spring - but my order went out Pye-less. Next year. This is a great plant. I got my first Joe today! I was visiting a new-to-me plant nursery and happened to notice a certain flower that the bees were all over. I've been needing some bees in my garden, so I asked one of the workers what it was. Sure enough, it was a Joe! She showed me where they were for sale, but I'll have to go out tomorrow and look which one I actually got. I can't remember! Not sure if it'd be suited to the middle of my vegetable garden or not; but if not, somewhere close for sure!